With 20 years of experience, workplace bullying expert Dr. Joel Haber, can help your organization adopt a culture of respect, civility, and empathy. More than 25 million people have been bullied at work. According to Dr. Haber, it can be difficult for managers and leaders to deal with bullying in the workplace for a number of reasons.Many bosses bully their employees—through public humiliation, impossible assignments, and favoritism. 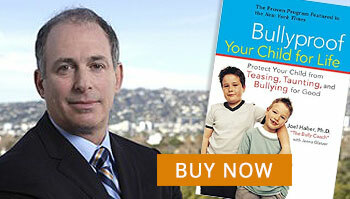 They believe it increases productivity ~ and believe that bullying is normal behavior. Other bosses use subtle methods of bullying, like ignoring a targeted worker, changing the subject of a discussion when they walk in a room, or leaving them out of office activities. Whatever type of bullying tactics are used, it produces stress, anger, resentment and lack of productivity.The dynamics of these situations are complicated and can ruin your work experience. Bullying at work NEVER leads to good business. Targeted training initiatives allow organizations to establish a culture of respect which will reduce the risk of bullying incidents. Dr. Haber’s interactive workplace bullying sessions include a hands-on approach to develop respect and shift the organizational culture. Dr. Haber can help executives hone their abilities as leaders who establish a culture of respect in the workplace and who also swiftly respond to bullying incidents than can hurt a company’s reputation in the public eye.. The mastery group format deploys a program of structured content for leaders delivered through group sessions. He then provides one-on-one coaching calls for leaders to gain mastery and achieve sustainability. The mastery group program is designed align with the schedule of busy leaders who want to make workplace respect part of their organizational culture. These deployment options can be blended to accommodate both onsite learning, off-site events, and remote learning. an additional 15% have witnessed bullying. Firms have been slow to recognize and address this widespread problem. In the 2010 WBI survey 35% of those who experienced workplace bullying firsthand believed that their employers were unaware of the problem and a further 46% believed that employers actively resisted addressing it. Workplace bullying can sometimes lead to a reputation issue that sheds a poor light on your business. If you discovered that your business reputation image has been tarnished. Learn about Dr. Haber’s Corporate Reputation Management program.